Well folks it’s finally here, the moment so many of us have waited for…Persona 5 finally has a North American release date for PlayStation 4 and PlayStation3! Atlus’ PR Manager John Hardin announced today via the Playstation Blog that “The Phantom Thieves are coming to take your heart on Feb. 14, 2017”. Depending on relationship status this could be a problem of priorities for some since the 14th of February is Valentine’s Day in North America, my advice would be to plan accordingly and begin working on your excuses now…wink wink. In true Atlus fashion Persona 5 fans will treated to a pretty nice Persona 5 “Take Your Heart” Premium Edition which is exclusive to the PlayStation 4 version and includes a bunch of goodies in a massive collectors box. 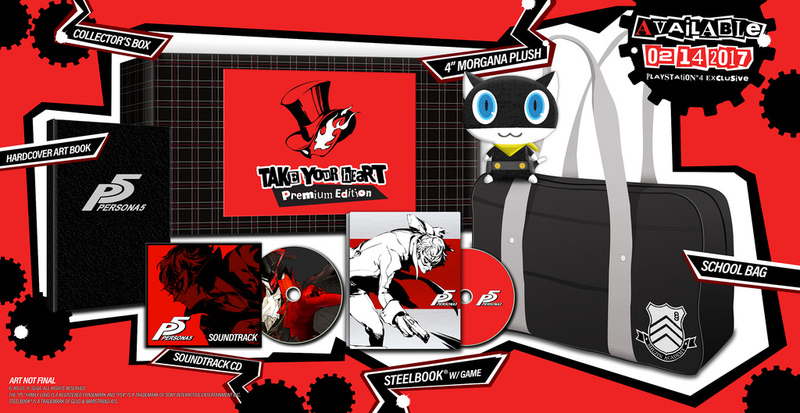 The Persona 5 “Take Your Heart” Premium Edition will be available for $89.99 but according to Wario64 via Twitter it has already sold out on Amazon and within an hour! Hopefully more Premium Editions will be made available so just keep your eye out or check you local brick and mortar shops. Of course the staff here at RGM will try our best to let you know if more copies are made available online in the near future. 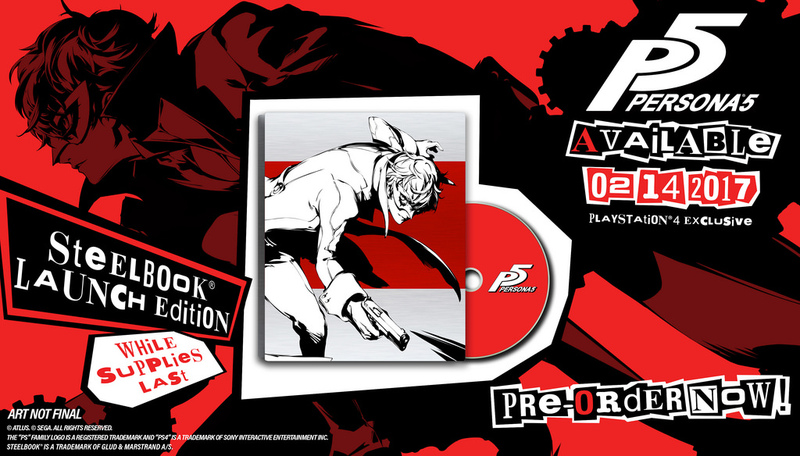 If you are only interested in the PlayStation 4 version of the game Atlus is also releasing a special SteelBook Launch Edition, which will be available for all pre-orders and a very limited number of launch copies. The PlayStation 3 version is available as well and will retail for $49.99 and issued in a standard case. I’m sure many of you out there may be a bit bummed that Person 5 isn’t launching in 2016 as Atlus initially planned but consider that a good localization takes time, as does playing through a good RPG. Early 2017 could be a great time to receive a game like this when things traditionally are a bit slower as far as game releases go. If you couple Persona 5’s release date with the recent delay of Horizon: Zero Dawn which is set to release a few weeks later then February should be a pretty busy month for all PlayStation 4 owners.